CD26 expressed by stromal cells, but not HSPCs, regulates HSPC trafficking. CD26 expression on PB LSK (A) and SLAM LSK (B) cells (mean ± SEM; n = 3 mice/group/experiment, each assayed individually; n = 3 experiments). CD26 expression on BM LSK (C) and SLAM LSK (D) cells (mean ± SEM/femur; 1 of 2 independent experiments; n = 4 mice/group/experiment, each assayed individually). (E and F) HSPC mobilization in chimeric mice. (E) CD26–/– donor cells transplanted into WT recipients and (F) WT donor cells transplanted into CD26–/– recipients. 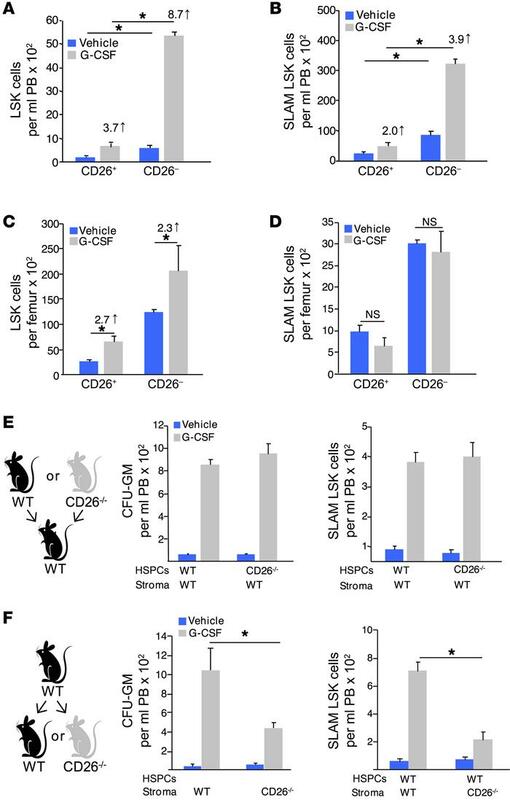 Two months after transplantation, mice were treated with G-CSF, and PB hematopoietic progenitor cells (HPCs) were determined by CFC assay, and SLAM LSK cells were analyzed by flow cytometry (mean ± SEM; n ≥ 5 mice/group, each assayed individually). *P ≤ 0.05, by 1-way ANOVA with Sidak’s multiple comparisons test.